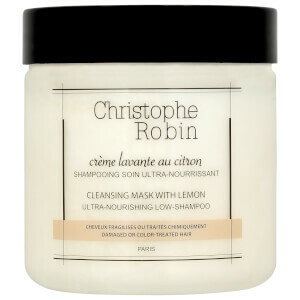 It's time to treat your tresses to the very best in hair care innovation, with the king of shampoos - Christophe Robin Cleansing Mask with Lemon. This remarkable formula is specially designed for use on coloured, highlighted and extra sensitive hair because it does not strip locks of their strength or vitality. In fact, it leaves hair shiny, soft and feeling luxurious. This shampoo is infused with zesty lemon extracts, which are designed to exfoliate hair follicles as they are being cleaned and rehydrated. There is no better product on the market for coloured hair. Aqua (Water), Cocamide Mea, Cetearyl Alcohol, Decyl Glucoside, Hydroxypropyl Guar Hydroxypropyltrimonium Chloride, Cetyl Alcohol, Behentrimonium Methosulfate, Cetrimonium Chloride, Citric Acid, Polysorbate 60, Glycerin, Parfum (Fragrance), Chamomilla Recutita (Matricaria) Flower Extract, Sodium Hydroxide, Tocopheryl Acetate, Citrus Medica Limonum (Lemon) Peel Extract, Artemisia Abrotanum (Southern Herb) Extract, Achillea Millefolium Extract, Disodium Edta, Methylisothiazolinone, Methylchloroisothiazolinone, Magnesium Chloride, Magnesium Nitrate, Benzyl Salicylate, Limonene,Sodium Benzoate, Potassium Sorbate, Benzyl Alcohol.